Since the beginning of Best Lent Ever, I have had more people than ever before tell me how inspired they were by the daily videos from the Dynamic Catholic staff and myself. So I want to share with you who inspires me, as well as an ancient spiritual practice that is a great source of inspiration for me. The most inspiring people I know are our Ambassadors. This passionate group of men and women, of all ages and from all over the country, makes personal sacrifices to support everything we do at Dynamic Catholic. The fruit of their generosity is overwhelming. Just this year, more than 600,000 people joined us for Best Lent Ever, and more than 430,000 people received a copy of one of our books at Easter. But what’s even more significant is that the Ambassadors made it possible for us to develop Blessed, the Dynamic Catholic First Communion & First Reconciliation Experience. The excitement around the release of this groundbreaking program has been astounding. In just under two months, we’ve already received more than 14,000 pre-orders! That’s more than we ever dreamed of. Thank you for being a part of this and for sharing Blessed with your family, friends, and parish. This program is going to change the way your children and grandchildren experience the Catholic faith, and it is perhaps the most important program we will ever produce. I’m amazed at what can happen when people come together. What would happen if people all over the country came together to pray for America? The truth is, we all know things need changing. And prayer is one of the most effective ways to bring about change. That’s why we’ve launched an exciting new initiative around uniting people in prayer. And not just any prayer, but an ancient and epic prayer: the rosary. The rosary works. When I pray the rosary, I am a-better-version-of-myself. It makes me a better son, brother, husband, father, employer, neighbor, citizen, and a better member of the human family. It is a source of inspiration to me, and it brings me incredible peace. The rosary is like stepping back from the crazy, noisy, busy world, into a calm, quiet, peaceful place. It settles our hearts and minds, puts things in perspective, and allows us to see things as they really are. It teaches us to slow down, let go, surrender, and listen. It teaches us how to just be. In some ways, the rosary is the perfect prayer for busy people in a busy, confused world. We probably need the rosary today more than any other time in history. So I invite you to join me, the Dynamic Catholic team, and people across the country in praying 5 million rosaries for America. Whether you pledge one rosary or 100 rosaries, whether you’re new to the rosary or you’ve made a habit of praying the rosary, your prayers make a difference. Click here to pledge your rosaries and join us in this powerful movement. May God bless you and fill you with an incredible peace. There’s never been anything like Blessed in the Catholic world for children. World-class animation. Workbooks that are works of art. Catechist-friendly leader guides. And incredible content that meets children where they are and leads them, step by step, to where God is calling them to be. Blessed isn’t just different, it’s groundbreaking. Take a look inside the Blessed workbook! Now that you have discovered the healing power of God’s forgiveness and the life-changing power of the Eucharist, it’s a good time to think about why God has blessed you in so many ways. God has blessed you because he loves you. He has blessed you because he wants you to live a fabulous life here on earth and to live in heaven with him forever. And God has blessed you because he made you for mission. God gives every single person a mission. It may take some time to work out exactly what mission God is calling you to, but you have already learned about the most important part of your mission: to bring God’s love to everyone you meet. You were made for mission. God didn’t make you just to have fun. He didn’t create you to waste your time on things that are superficial. God made you for mission. In the beginning, our goal was simple. We set out to create the very best First Communion and First Reconciliation programs in the world—the most dynamic programs to prepare your children and grandchildren for these great Catholic Moments. As with all of our programs our first step was to rigorously explore what was working, what wasn’t, and what experts and volunteers on the front lines thought was needed. We spent an entire year just listening. Meetings—hundreds of meetings, focus groups, and phone calls. You told us you wanted engaging workbooks, catechist-friendly leader guides, resources that draw parents into the process, and powerful music. You told us it would be nice if for once, our Catholic materials were as good as the secular programs our children experience every day. But most of all you wanted programs that help your children discover the genius of Catholicism in a way that inspires them to become lifelong Catholics. Well, we listened. This is Blessed . . .
At Dynamic Catholic we believe everything we do as Catholics should be excellent. The beautifully illustrated workbooks and leader guides are made up of more than 250 hand-painted works of art by an internationally acclaimed artist. The combination of rich visuals and dynamic content brings the faith to life for children more than ever before. The content meets children where they are and leads them, step-by-step, to where God is calling them to be; the catechist-friendly leader guide has been designed to maximize the effectiveness of busy volunteer catechists; and the parent component is an answer to what bishops, priests, DREs, teachers, and catechists have been crying out for—a dynamic way to engage disengaged parents to make faith a priority in their lives. But even all of this wasn’t enough. Our research revealed that cognitive retention in children between the ages of 6 and 9 is directly linked to emotional connection, and nothing connects with children on a significant emotional level quite like animation. So we thought it was time for Catholics to harness the techniques Disney has been using for more than 90 years to influence our children. We teamed up with an Emmy Award-winning animation studio to create the first-ever animated film series for sacramental preparation. Each of the 84 episodes will engage your children’s sense of wonder and take them on an unforgettable adventure into the story of Jesus and the life-giving truths of his Church. Blessed is made up of two programs, one for First Communion and one for First Reconciliation. 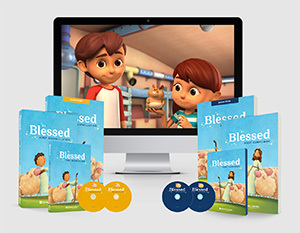 Each Program Pack includes a student workbook, leader guide, DVD series containing 42 animated short films, and a children’s Prayer Process card. Pre-order your FREE Program Packs today! Just pay shipping. People around the world have been fascinated by Our Lady of Fatima since her first appearance on May 13, 1917. The messages, the predictions, the miracles. This month marks the 100th anniversary of Fatima. What are we to make of it? You’ll find the key to Fatima is simply seeking to understand Mary’s message. It is a message of love, healing, and a path to incredible happiness. Learn to pray the rosary, the prayer that can change the world. Let Mary guide you to lasting happiness. The message is simple and practical, yet it is profound and life changing. Every time Mary appeared to the children, she asked them to pray the rosary. Why? The rosary is incredibly powerful. It has the power to bring peace. The power to heal. The power to make a difference in your life, the lives of your loved ones, and in the world. The rosary settles our hearts and minds. We live hectic lives in a chaotic world, a world troubled by war, violence, and brokenness. Amidst the chaos and confusion, our souls yearn for peace and clarity. How does the rosary bring us that serenity? The rosary puts things in perspective and allows us to see things as they really are. It reaches deep down into our souls and puts us at ease, creating a peace that is rare and beautiful. It teaches us to slow down, calm down, let go, offer our struggles to God, and listen. The rosary teaches us how to just be, and that is not a small or insignificant lesson. In some ways it is the perfect prayer for busy people in a crazy, noisy, confused world. The rosary has the power to the impact the lives of our loved ones, our communities, and our nation. When we pray the rosary, we can bring our needs and struggles, and the needs of others, to Mary. She cares for us like a loving mother, and she wants to bring our troubles to her son, Jesus. What can we pray for? We can pray for our nation, our leaders, and our troops. Praying the rosary can bring peace to a troubled world, healing to broken hearts, and clarity to those in chaos. The impact the rosary can have is incredible. In fact, Mary even promised that the rosary could bring an end to war! The power of the rosary—and Mary’s invitation at Fatima to pray it—has inspired Dynamic Catholic to launch a campaign to pray 5 Million Rosaries for America. Together we can have an incredible impact on our country. Whether you pledge one rosary or one hundred rosaries, your prayers make a difference. Join us! God has an incredible dream for you, one that can fulfill your deepest desires and longings. But we often get distracted. We make the mistake of hoping that certain people or things will fill us, but they can pull us away from God. Mary invites us back. Over and over again at Fatima, Mary encouraged us to turn away from the things in our lives that hold us back. The things that keep us from finding the happiness God wants for us. Identify the things in your life that need to change. Pick one bad habit, then focus on the positive habits that can crowd out that bad habit. Make fasting part of your spiritually. God wants to liberate you from your struggles. But some things in our life can only be overcome by prayer and fasting. Whether you fast from food or something else like noise or complaining, offer your struggle to God, and practice fasting. Even if it has been a long time, make an effort to go to Reconciliation. Be gentle with yourself, but embrace the opportunity to find forgiveness and healing. Establish a daily habit of prayer. It doesn’t have to be long. Try just 10 minutes a day. You’ll be amazed at the results. The journey is worth it. You will find incredible happiness if you embrace God’s dream for you. You will be blessed with spiritual vitality. You will become all that you can be: the-very-best-version-of-yourself. God has an incredible dream for you, one that can fulfill your deepest desires and longings. Mary is the most famous woman in history, and her impact on the life of Jesus, history, art, the Church, and people of all faiths is significant. And at Fatima, Mary offered to guide us as we strive to live the life God has called us to. But who is Mary to you? And what role can she play in your spiritual life? Mary is an incredible example of someone who embraced and lived God’s dream for her. Her yes changed the world. Mary can give us the courage and hope to say yes to God’s dream for our own lives. Mary can help us get know Jesus in a way that nobody else can. She offers a unique perspective as his mother. Nobody sees the life of a child the way the child’s mother does—not even the father. This is Mary’s perspective of Jesus’ life. Imagine what we can learn from her! Just as Mary was incredibly close to Jesus on earth, she remains close to him now in heaven. Mary’s greatest desire is to bring us to her son. All we have to do is ask, and she will bring us, along with all our desires, needs, and struggles, directly to her son. Mary’s yes changed the world. She can give us the courage and hope to say yes to God’s dream for our own lives. Will You Accept Mary’s Invitation? It’s a simple message. Pray the rosary. Get spiritually healthy. Let Mary guide you. At times it can be challenging, but the moment we open ourselves up to God’s dream for us is the moment miracles begin to happen in our lives. Will you accept Mary’s invitation? 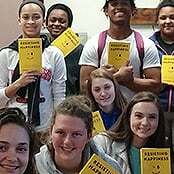 I teach religion at Holy Cross High School in Covington, Kentucky, and I’ve been using Resisting Happiness by Matthew Kelly with my seniors since after Christmas. Our pastor, Fr. Barnes, gave us the copies that were left over from the Dynamic Catholic Christmas Books Program. The students love them. We read the first two chapters for class, but the students have been using the book outside class too—on their own, with their families, etc. I even saw many of them bring the books on retreat. I gave the book to a sophomore in the group too. She is on fire with her faith for the first time, and Resisting Happiness is exciting her more each day! After giving this book to my students, I got an email inviting me to participate in Dynamic Catholic’s free email program Best Lent Ever. This year it was based on Resisting Happiness. What an incredible program! I used the videos to begin each class this Lent. I also challenged my students to read one chapter of Resisting Happiness before bed each night and think about how they could practice what they learned the next day. The messages in Matthew Kelly’s latest book and Best Lent Ever were exactly what my seniors needed and even wanted to hear. What a blessing! Thank you so much and keep doing God's blessed work!